Linz based, international research group Social Bits aims to reintroduce Istanbul, European Capital of Culture through new and different channels. It focuses on transforming the thoughts and comments of people living in İstanbul, which shared through online social networks, into digital and physical works of art. The theme of the show itself is again the city and the information cloud it generates. Collective Data Maps is an open mapping project for exhibition visitors. There are two İstanbul city maps printed and prepared for collaboration within the gallery. 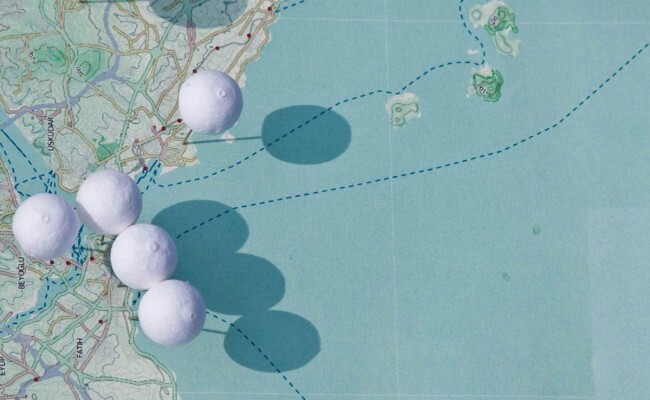 With small cloud-shaped pins, visitors will take part in creating physical data maps of İstanbul that reflect the most liked and most disliked locations of İstanbul as told by its citizens. Fluid Data (Jayme Cochrane) is a dynamic urban interface combining social data with architecture. The amount of location-specific content being posted online is impossible to keep track of, and this project intends to make that data visible. Real-time Twitter posts from İstanbul and İstanbul news articles will gently flow around the gallery, showing how much data about the city is constantly being created in real-time. Highlighting architectural elements, the data will follow paths in and out of a room, appearing in the space via the Internet, flowing along the architecture, then disappearing again, back into the social data sphere. 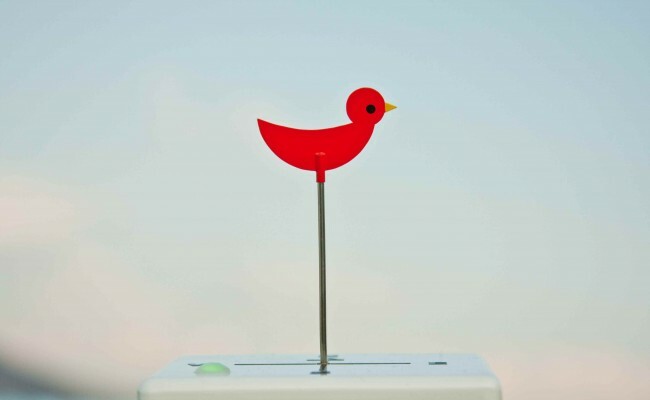 kazamidori (h.o) is a media gadget like weather vane to indicate the direction of where visitors in a website are coming from in real-time. The weather vane is designed as a bird, like traditional weather vanes, as it will face the direction where the virtual ‘wind’ is coming from. Every day, visitors arrive at the website virtually and kazamidori aims to physically display where the interested audience is, on a worldwide level. News Leak (Tim Devine, Jayme Cochrane , Shervin Afshar ) is a publication, a motivated functional hybrid of the latest news and culture from the real world and cyberspace, derived from established news, social media and location probes. Our aim is to cultivate a functional exchange of news and culture between life in the real space and life in cyberspace. 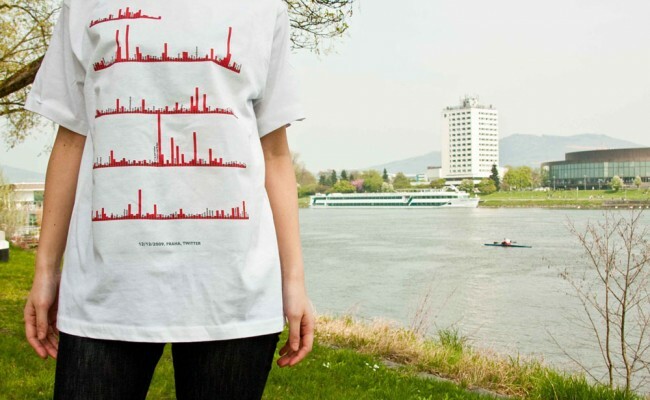 Urbansphere Wearables (Mahir M. Yavuz) aims to reflect the daily keywords of the city by utilizing the data streams of social networks as a source of fashion design. The project initiates “social sensors” (special filters and data gathering scripts that follows Twitter) in order to collect information on social networks created by different inhabitants of the same city. The data gathered is then visualized and turned into a pattern for wearables that represent the recent topics and discussions of urban people. In the exhibition, visitors will see a set of unique wearables that contains data from İstanbul. Urban Mood visualizes the real-time mood of the citizens of İstanbul. It is a projection and sound installation situated in a small room. The installation continuously collects the data from Tweeters in İstanbul, analyzing and summarizing each post in a single word. Through this keyword, the source tweets will create a typographic animation on the floor of the room, while colors and sounds will change to suit the content of the keyword. By sharing their personal thoughts on Twitter, every İstanbulian becomes a part of this mood production. With the support of Austrian Cultural Forum and EU-Japan Fest. 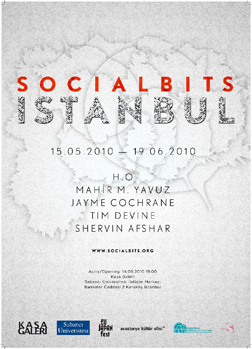 We thank the 2010 Istanbul Agency for their announcement support. Mahir M. Yavuz is a designer and researcher who lives and works in Linz, Austria. He is currently engaged in doctoral studies in Interface Culture at the University of Art and Design Linz. Besides giving lectures at the same university, he also works as a senior researcher of graphic design at the Ars Electronica Futurelab. Jayme Cochrane is an interaction designer currently based in Linz. After receiving a B.Sc in Interactive Arts (focus Interaction Design) from Simon Fraser University in Canada, he moved to Linz to work in the Ars Electronica Futurelab. He is currently also pursuing a master’s degree in Interface Culture at the University of Art and Design Linz. h.o (Hide Ogawa, Taizo Zushi, Jun Yura and Emiko Ogawa) is an international media art group from Tokyo creating conceptual art works using a mixture of media combined with digital technology. “h.o” derives from the chemical symbol for water, H2O, implying h.o’s interest in various forms of communication between people. Its activities and ideas are inspired by little awareness that appear in everyday scenes and criticism on information-oriented society. Timothy Devine followed artist residencies at Experimedia in Melbourne, Kitchen Budapest developing Newsleak and MediaLab Prado, Madrid where he developed The Mexican Standoff - Creating a Hyperreality. He presented papers at Technarte, Bilbao and Computer Space, Sofia. His work has been written about around the world, with interviews on national radio CBC Canada and radio Australia. He has been commissioned for interactive installations at the State Library of Victoria and Oxfam. He currently lives in Linz Austria following his Masters of Interface Cultures at the Kunstuniversität. Shervin Afshar (1980, Iran, http://www.shervinafshar.name). After graduating as a software engineer, he started to work as an independent media artist in Tehran. In 2008, he joined Ars Electronica Futurelab as a creative engineer. Since 2009, he is a master student in Interface Cultures at the University of Arts and Design in Linz, Austria. His works have been presented in exhibitions in Iran, Germany (TypoBerlin), and United States (Digital Ritual). Current focus of his works is on the role of time-based and live online data and textual information as a base for creating new experiences using the digital media.